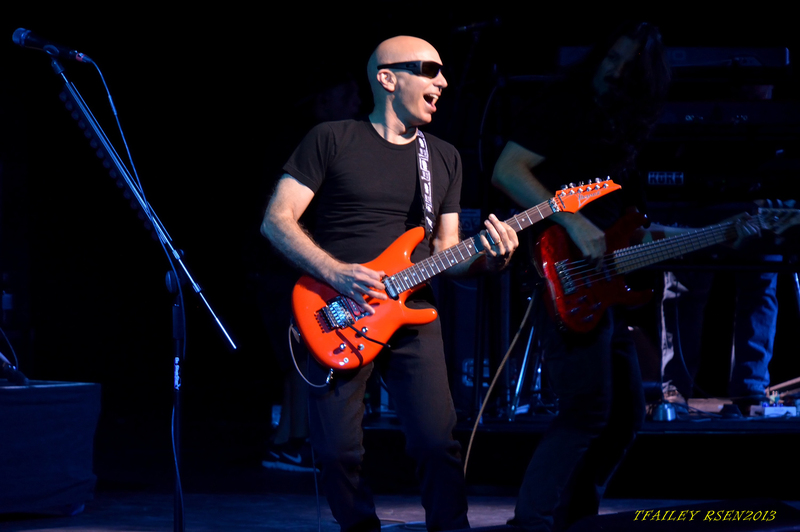 Clearwater, Fla. — Guitar virtuoso Joe Satriani and his bandmates played to a packed crowd at Ruth Eckerd Hall in Clearwater on Wednesday September 11th in support of his “Unstoppable Momentum” release and gave the crowd everything they could have hoped for. Not only was Joe Satriani touring on “Unstoppable Momentum” but it’s also the 25th anniversary of the release of “Surfing with the Alien.” “Surfing with the Alien” is the cd that put Joe Satriani on the map and made him a household name at the addresses of most rock guitar players and fans of music everywhere. Prior to the release of Surfing with the Alien, Satriani was mostly known for instructing some of the biggest names in rock/metal guitar playing history in Metallica’s Kirk Hammett, Testament’s Alex Skolnik and Steve Vai. “Surfing” takes you on a non-stop journey that makes you feel like you are the comic book character, The Silver Surfer, which dons the album’s cover. Placing this image as the album art was a stroke of genius. Not only in a marketing aspect, but it made you believe that you were listening to a guitar superhero. 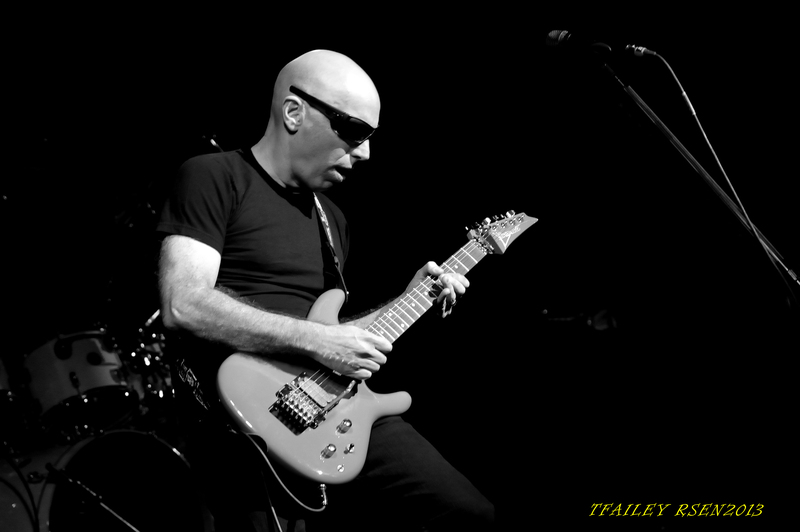 I was introduced to Satriani at this stage of his career and Surfing made a lasting impression on me that remains to this day. Whenever I’ve been down in my life, I have always found that listening to “Surfing with the Alien” or my other favorite release, “Flying in a Blue Dream,” have always lifted my spirits and made me look at things in a different light. Like many others, music is my sanctuary and I find comfort and release in it and through it. After suffering two family tragedies in the same week, I was hoping that seeing this show in Clearwater might brighten my spirits, and let my mind and heart go to a different place, at least for a little while. The show didn’t disappoint. 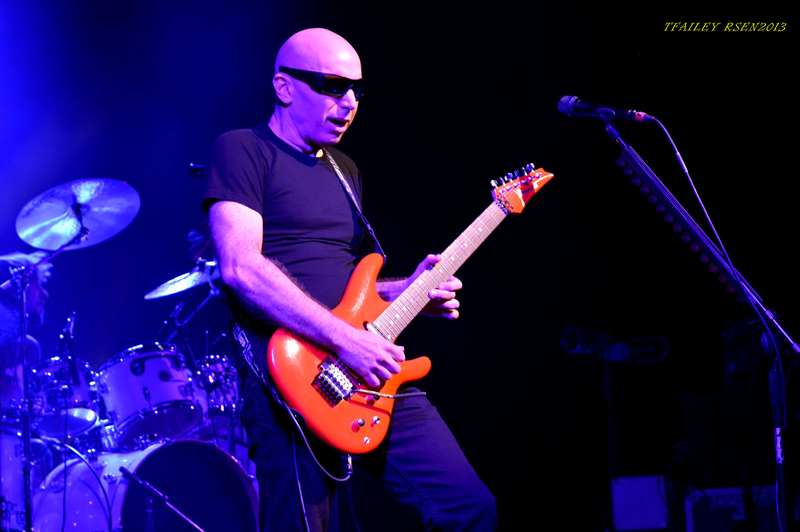 When Satriani opened the set with “Jumping In” and ”Devils Slide” then into “Flying in a Blue Dream,” the audience knew that we were in for a special night of music from the guitar legend. The music was accompanied by breathtaking visuals on the big screens that included mountaintops, skylines, and roadways that were perfectly in sync with the music throughout the show. Joe and his crew took you on a rollercoaster of sights and sounds. You almost thought that you were in a flight simulator traveling on an intergalactic journey, as Joe likes to use his alien and space imagery to background visual perfection. 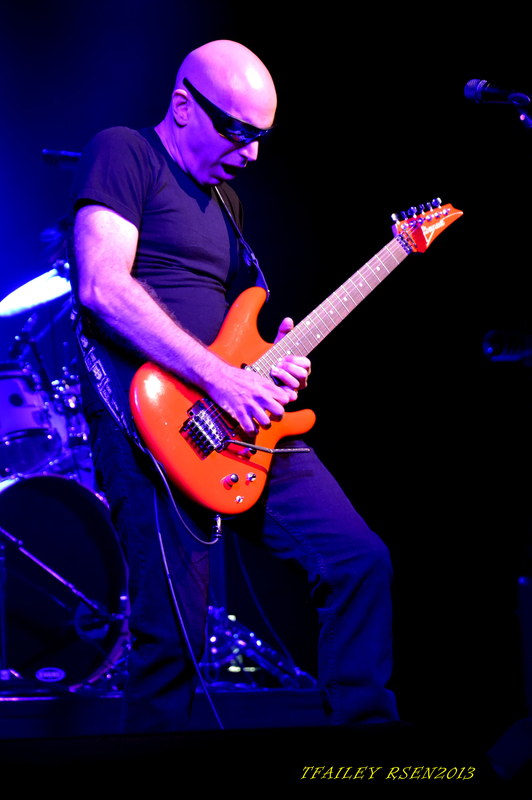 Playing for two hours with his bandmates, which included guitarist/keyboardist Mike Kenneally (Frank Zappa, Steve Vai), bassist Brian Beller, and drummer Marco Minnemann, they cruised through 20 songs that made you feel like you were there for only 20 minutes. 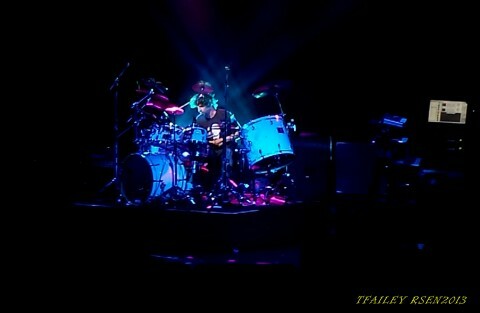 Marco Minnemann was a master stickman throughout the night and provided an unbelievable drum solo. After years of witnessing drum solo after drum solo at 90 percent of the shows that I’ve attended, I have come to despise this part of the concert and I find it to be boring and a waste of valuable set time. I would prefer more songs & less solos. But tonight was different. Marco brought a jazzier flair and style to his approach during his solo. Instead of the usual, “I can hit the skins faster and harder than anyone” solo that we are accustomed to in the rock/metal community, Marco played his drums with poetic movements and sounds that are not heard frequently. Instead of “Is he almost done with this so we can move on?” I was wondering “ where is he going next with this?” If other drummers would take this type of approach, I believe more of the audience would remain in their seats and not head to the closest concession stand. Other highlights from tonight’s set included “Ice 9”, “The Crush of Love” and the goose bump inducing “Always with Me, Always with You.” You would think that two hours of instrumental music might get a little redundant but the guys keep the pace moving and the crowd engaged with their smiles and showmanship that shines through and provides a carnival like arena atmosphere. 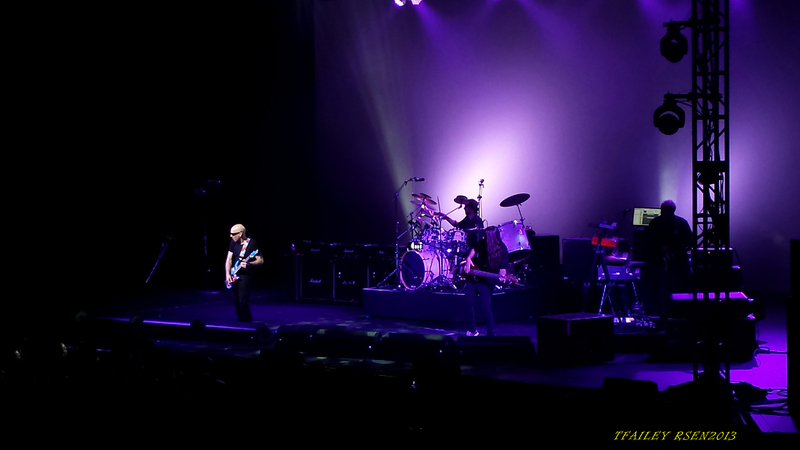 Closing out the show with the title track from “Surfing With The Alien” and encoring with “Summer Song,” Joe and his bandmates provided a great night out for all the fans in attendance and provided me a well needed escape from the realities of life. Throughout the performance Joe smiled on stage, not only with his face but with his guitar and through this I was able to look back on the last 25 years of being a fan of Satriani’s music and know that I need to remember that through the trials and tribulations of life, it’s imperative to remember the good times and to smile, once again.